Kaspersky Labs published a technical analysis of a new malware, Silence that is aimed at attacking financial institutions. After uploading the loader of this malware to Intezer Analyze™, we have found a possible connection through code reuse to the loader of another campaign of malware, Mole previously discovered by Unit 42 of Palo Alto Networks. This connection might be an indicator that these two attacks are originated from the same threat actor, but currently it is too early to tell. 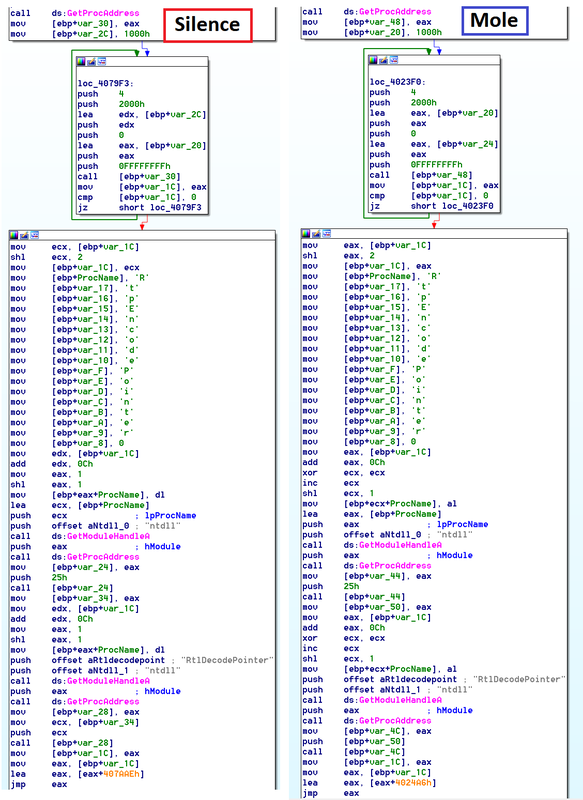 If we look at the code of the two loaders used by both campaigns side by side, we can see that the code is very similar and according to our system is unique to these families of malware. In addition to the links within the code, there are several other similarities we have witnessed between the Mole and Silence malware, such as the attack vectors (spear phishing, packaging of the malware) and motives — which can be extra evidence for this connection. Yet again, we see that identifying code reuse can be very valuable in detecting new malware, and in some cases for attribution purposes. We invite you to read more of the posts in our blog and to request an invite to the community edition of our product. Follow @IntezerLabs and myself @jaytezer for more updates.